Before another weekend slips away, I want to share with you some of the fun I enjoyed with the nieces this past weekend. First, I have to tell you what their requests were for the weekend: crafting (painting and soap-making) and a movie (snuggling up on the couch with big bowls of popcorn.) We didn't get to soap-making but accomplished their other goals and so much more. Take a peek. Some toenail painting was done. Each girl picked two colors and we went to town. 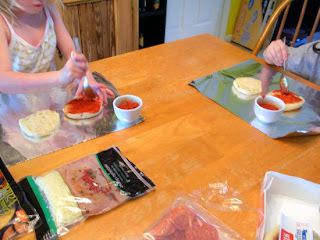 For lunch, we made mini pizzas on english muffins. 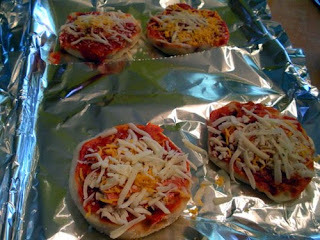 (spread sauce, add topping and cheese, then heat in oven at 350 for 10 mins, and DONE) I found that having them work on aluminum foil kept the mess down as I could just put them on a cookie sheet (foil and all) to cook. We played in my button stash and made some button flower bouquets. Not pictured: jamming in the car with the windows down, climbing trees, exploring the back yard, playing the Wii, painting, making cinnamon twists for breakfast, catching bugs (for the bug catcher necklaces of course). It really was a blast!! I love the bug catcher necklaces. 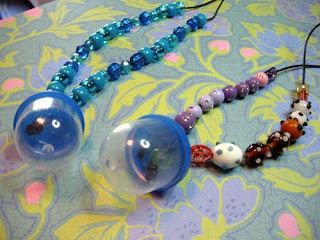 Are those lampwork beads or acrylic? Just make sure the bugs are released in a timely manner. Hobby Lobby carries a plastic pony bead that glows in the dark. They come in three sizes, one of which is a star shape. They would make a great "lightning bug" catcher necklace. I've used them on fishing lanyards that I make on stainless beading wire. Makes it easy to see and handle the necklace at night. Ben- I know!! Thanks. Thing is, I only get them every so often, so I have plenty of time to come up with fun things to do with them. I enjoy it too!! Thanks Susanna, we had a great time. There was some whining, but overall, it was fun!! Alright, Hope. I've been waiting patiently for two weeks. Let's get blogging!!! Add to that, that you’re crazy! I totally look forward to reading your blog. It’s like you package up this nice little present of entertainment for the opening. I really just wanted to let you know that I was missing your posts!!! Thanks Ben. I hope you see I just got one up. Your comment pushed me to do it. So, thanks! !